With the Houston Texans joining the NFL, the league's teams were realigned into eight divisions: four teams in each division and four divisions in each conference. In creating the new divisions, the league tried to maintain the historical rivalries from the old alignment, while at the same time attempting to organize the teams geographically. 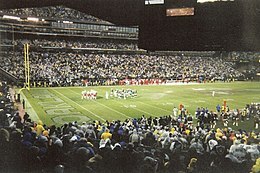 Legally, three teams from the AFC Central (Cincinnati, Cleveland, and Pittsburgh) were required to be in the same division as part of any realignment proposals; this was part of the NFL’s settlement with the city of Cleveland in the wake of the 1995 Cleveland Browns relocation controversy. The Indianapolis Colts, the Tennessee Titans, the Jacksonville Jaguars and the inaugural Houston Texans were placed into the newly formed AFC South. This kept the Indianapolis Colts & Peyton Manning from moving to the more geographically correct AFC North. The Atlanta Falcons, the New Orleans Saints, the Carolina Panthers, and the Tampa Bay Buccaneers were placed into the newly formed NFC South. The teams in the AFC Central and NFC Central were placed in the new AFC North and NFC North respectively, apart from the Titans, Jaguars and Buccaneers. The Seattle Seahawks became the only team to switch conferences twice, moving from the AFC West to the NFC West (where they had been for their inaugural season). The Arizona Cardinals moved from the NFC East to the NFC West. They had originally played in Chicago and then St. Louis before moving to Tempe, Arizona in 1988. Additionally, the arrival of the Texans meant that the league could return to its pre-1999 scheduling format in which no team received a bye during the first two weeks or last seven weeks of the season. From 1999 to 2001, at least one team sat out each week (including the preseason) because of an odd number of teams in the league (this also happened in 1960, 1966, and other years wherein the league had an odd number of teams). It nearly became problematic during the previous season due to the September 11 attacks, since the San Diego Chargers had their bye week during the week following 9/11 and the league nearly outright canceled that week’s slate of games. The league also introduced a new eight-year scheduling rotation designed so that all teams will play each other at least twice during those eight years, and play in every other team’s stadium at least once. Under scheduling formulas in use from 1978 to 2001, two teams in different divisions might never play each other for over fifteen seasons. [note 1] Under the new scheduling formula, only two of a team’s games each season are based on the previous season’s record, down from four under the previous system. All teams play four interconference games. An analysis of win percentages in 2008 showed a statistical trend upwards for top teams since this change; the top team each year then averaged 14.2 wins, versus 13.4 previously. The playoff format was also modified: four division winners and two wild cards from each conference now advance to the playoffs, instead of three division winners and three wild cards. In each conference, the division winners are now seeded 1 through 4, and the wild cards are seeded 5 and 6. In the current system, the only way a wild card team can host a playoff game is if both teams in the conference’s championship game are wild cards. However, the number of playoff teams still remains at 12, where it has been since 1990. A player who touches a pylon remains in-bounds until any part of his body touches the ground out-of-bounds. Continuing-action fouls now become dead-ball fouls and will result in the loss of down and distance. Any dead-ball penalties by the offense after they have made the line to gain will result in a loss of 15 yards and a new first down. Previously, the 15 yard penalty was enforced but the down was replayed. The act of batting and stripping the ball from a player is officially legal. Chop-blocks are illegal on kicking plays. Hitting a quarterback helmet-to-helmet anytime after a change of possession is illegal. After a kickoff, the game clock will start when the ball is touched legally in the field of play. Previously, the clock started immediately when the ball was kicked. Inside the final two minutes of a half/overtime, the game clock will not stop when the player who originally takes the snap is tackled behind the line of scrimmage (i.e. sacked). The home team must determine whether their retractable roof is to be opened or closed 90 minutes before kickoff. If it is closed at kickoff, it cannot be reopened during the game. If it is open at kickoff, it cannot be closed during the game unless the weather conditions become severe. Reebok took over the contract to be the official athletic supplier to the NFL for all 32 teams’ uniforms. Previously, all teams had individual contracts with athletic suppliers. American Needle, which had a contract with a few teams before the Reebok deal, challenged the NFL in court over Reebok’s exclusive deal, with the NFL effectively stating that it was a “single-entity league” instead of a group consisting of various owners. The case eventually went all the way to the Supreme Court of the United States. In 2009, the Supreme Court agreed to hear American Needle, Inc. v. National Football League. In 2010, the court ruled that the NFL is not a single entity. The legality of the NFL's exclusive contract with Reebok is still in question by the lower courts as of October 2010. Reebok remained the league's athletic supplier through the 2011 NFL season, when Nike took over the contract for the 2012 NFL season. Reebok had initially announced when the deal was signed in 2000 that aside from the expansion Texans, all NFL teams would be wearing new uniforms for the 2002 season. However, after protests from several owners—most vocally Pittsburgh Steelers owner Dan Rooney—Reebok later rescinded the proposal. Reebok did, however (by player request to reduce holding calls), shorten the sleeves on the jerseys for teams that hadn’t done so already (most players had been for the previous decade tying the sleeves tight around their arms to prevent holding) and made the jerseys tighter-fitting. This is perhaps most noticeable on the Indianapolis Colts jerseys, where the shoulder stripes, which initially went from the top of the shoulders all the way underneath the arms, were truncated to just the top portion of the shoulders. Although Reebok rescinded the idea of all NFL teams wearing new uniforms for the 2002 season, the Buffalo Bills and Seattle Seahawks did redesign their uniforms, with the Seahawks also unveiling an updated logo in honor of their move to Qwest Field and the NFC. Buffalo Bills – New uniforms that would be worn through the 2010 season. Washington Redskins – Added an alternative home uniform. Burgundy helmets with spear and feathers logo. Burgundy uniforms with white numbers with gold pants. 70th season logo on uniform. Detroit Lions – New tweaked logo and uniforms. Seattle Seahawks – New Logo. New uniforms. San Diego Chargers – Navy pants with road uniforms. St. Louis Rams – Removed side panels on uniforms. Cleveland Browns – Added third alternative uniforms. Orange uniforms with white number with brown shadow in the back. Carolina Panthers – Added third alternative uniforms. Panther blue with white number and black trim. New Orleans Saints – Added third alternative uniforms. Old gold uniforms with black numbers and white trim. Brought back old gold pants. Denver Broncos – Added third alternative uniforms. Orange. Chicago Bears – Played in Memorial Stadium in Champaign, IL while Soldier Field was being remodeled for the season. Houston Texans – Dom Capers became first head coach in Texans history. Oakland Raiders – Bill Callahan; replaced Jon Gruden, who was traded to Tampa for two 1st round draft picks, two 2nd round draft picks and cash. N.Y. Jets finished ahead of New England in the AFC East based on better record in common games (8–4 to 7–5) and Miami based on better division record (4–2 to 2–4). New England finished ahead of Miami in the AFC East based on better division record (4–2 to 2–4). Cleveland clinched the AFC 6 seed instead of Denver or New England based on better conference record (7–5 to Denver’s 5–7 and New England’s 6–6). Oakland clinched the AFC 1 seed instead of Tennessee based on a head-to-head victory. San Diego finished ahead of Kansas City in the AFC West based on better division record (3–3 to 2–4). Philadelphia clinched the NFC 1 seed instead of Green Bay or Tampa Bay based on better conference record (11–1 to Green Bay’s 9–3 and Tampa Bay’s 9–3). Tampa Bay clinched the NFC 2 seed instead of Green Bay on a head-to-head victory. St. Louis finished ahead of Seattle in the NFC West based on better division record (4–2 to 2–4). The 2002 NFL Draft was held from April 20 to 21, 2002 at New York City's Theater at Madison Square Garden. With the first pick, the Houston Texans selected quarterback David Carr from Fresno State University. ^ The most extreme cases were where the Philadelphia Eagles never played the Kansas City Chiefs from 1973 to 1991 inclusive, the New York Jets never played the Cardinals from 1979 to 1995 inclusive, the Miami Dolphins never opposed the New York Giants from 1973 to 1989 inclusive, and the Seattle Seahawks never played the Tampa Bay Buccaneers from 1978 to 1993 inclusive. ^ Murray, Ken (May 21, 2001). "Nfl Vote On Realignment Nears". Hartford Courant. Archived from the original on November 8, 2016. Retrieved November 6, 2016. ^ "Realignment for 2002". National Football League. May 23, 2001. Archived from the original on December 26, 2016. Retrieved November 6, 2016. ^ Mason, Andrew (May 23, 2001). "Old faces, new places". National Football League. Archived from the original on June 5, 2001. Retrieved November 6, 2016. ^ "American Needle Supreme Court Ruling: NFL Loses Lawsuit". Huffington Post. May 24, 2010. Archived from the original on May 27, 2010. Retrieved June 14, 2010. ^ "Nike strikes uniform deal with NFL". ESPN.com. Associated Press. October 12, 2010. Archived from the original on June 10, 2015. Retrieved June 19, 2017. ^ Bouchette, Ed; Dulac, Gerry (December 25, 2000). "Steelers Report: 12/25/00". Pittsburgh Post-Gazette. Archived from the original on November 26, 2010. Retrieved September 1, 2008. ^ "USATODAY.com - New Redskins uniforms suit Spurrier". usatoday30.usatoday.com. Retrieved May 2, 2018.